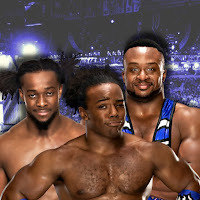 The New Day is going to Summerslam to face The Bludgeon Brothers after beating The Bar in the main event of Smackdown Live. The New Day earned the title shot by beating The Bar in the Smackdown Tag Team Tournament finals, winning a very competitive match by hitting The Midnight Hour to get the pin. The Bludgeon Brothers, who competed earlier in the night, were seen scouting their opponents from the arena floor in the crowd.